Robin Dawson is having an excellent season. Picture: Pat Cashman/www.cashmanphotography.ieFaithlegg’s Robin Dawson is just two strokes off the lead after the opening round of the 13th Duke of York Young Champions Trophy at Royal St George’s. The Irish Boys’ international, a recent winner of the Home Internationals with Ireland and the Jacques Leglise Trophy with Great Britain and Ireland, opened with a five over 75 in testing conditons to share third place behind Italy’s Guido Migliozzi at the storied Sandwich venue. As gusting winds blew across the Kent course, Migliozzi carded a three-over 73 to lead by one from Norway’s Kristian Johannessen (74), who was one shot ahead of a chasing pack of six players that included Dawson, England’s Jack Singh Brar and Scotland Bradley Neil and Robin Dawson from Ireland. American Nicole Morales and Finland’s Karina Kukkonen also shot 75 to be the leading girls in the 54-hole strokeplay event where national champions from around the world at under-18 level, both boys and girls, are invited to compete. Denmark’s Alexander Frances was the other player to sign for a 75 to share third after the first day’s play. 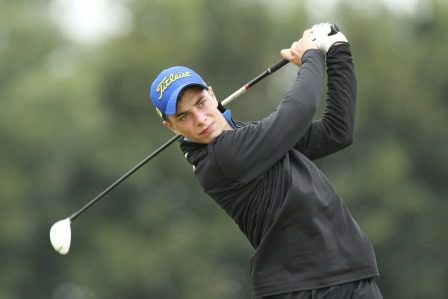 Migliozzi is no stranger to the prestigious invitational event and is also used to difficult links conditions after he competed in last year’s Young Champions Trophy at Royal Troon where Iceland’s Ragnar Gardasson defied the gales to win. “I played very well in tough conditions. My approach shots to the greens and good putting were key to my round,” said Migliozzi afterwards. The 16-year-old picked up two precious birdies at the second and the fifth where he holed both times from over 20 feet. From there the plus four handicapper played steady golf despite admitting he prefers to compete in sunnier conditions. “I’ve played a lot of links golf and I also played at Royal Troon last year. Today was a really good test but I much prefer sunnier conditions,” quipped the Italian. Morales arrived at Royal St George’s without any links golf experience but based on this evidence the New Yorker is certainly a quick learner. “That was very tough, very windy. I found today was a mental grind, especially as I have never played links style golf before,” said Morales, the plus five handicapper and winner of the Thunderbird International Girls Championship in the States. The 17-year-old holed a 60-foot birdie putt at the 11th and made a number of clutch par putts during her round. Other high points from the first round included Migliozzi’s compatriot Roberta Liti, who recorded an eagle two at the par four 10th. The 18-year-old holed her wedge approach from 70-yards in a round of 77, which left her tied 12th. This year’s Duke of York Young Champions Trophy has attracted a stellar field of 55 players from over 30 countries with a handicap of two or better. The invitational is the vision of the tournament’s namesake and John Simpson, who together wanted to create one of the premier under-18 tournaments in the world but also assist the junior players in their development and understanding of the game, both on and off the course. Royal St George’s is no stranger to hosting high profile events having staged the Open Championship 14 times, mostly recently in 2011 when Darren Clarke lifted the Claret Jug. The famous Sandwich venue has also hosted many PGA and Amateur Championships plus the Walker Cup and Curtis Cup. Faithlegg’s Robin Dawson. Picture: Pat CashmanFaithlegg’s Robin Dawson has been named in the nine-strong Great Britain and Ireland team to face the Continent of Europe in the Jacques Leglise Trophy later this month. Robin Dawson is having a fine season. 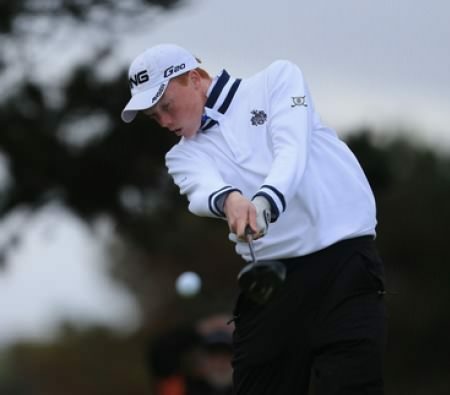 Pictured by Fran Caffrey/www.golffile.ie during the Irish Amateur Open.Faithlegg’s Robin Dawson won both his matches as Great Britain and Ireland took a firm grip on the Jacques Leglise Trophy after the opening day at Royal St David’s in North Wales. The triumphant Great Britain and Ireland team, with Robin Dawson standing second from left, with the Jacques Léglise Trophy.Fathlegg’s Robin Dawson was Great Britain and Ireland’s top scorer as they regained the Jacques Leglise Trophy with a convincing 15 – 9 victory over the Continent of Europe at Royal St David’s in North Wales. Leader Guido Migliozzi in action in the Duke of York Yoing Champions at Sandwich. Faithlegg’s Robin Dawson suffered a dose of the “shanks” that dented his chances of winning the Duke of York Champions Trophy at Royal St George’s. Robin Dawson (2nd from left) at the official dinner. Dawson has had an excellent season at both individual and team level. 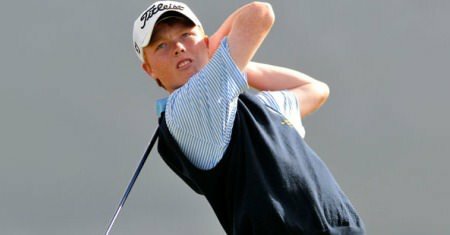 Faithlegg’s Robin Dawson finished a fine fourth behind Italy’s Guido Migliozzi the Duke of York Young Champions Trophy at Royal St George’s on Thursday.